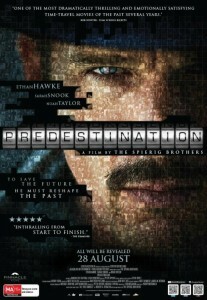 So an Eric Stoltz impersonator walks into a bar… That’s not a joke, that’s how Predestination starts. “Bet you a bottle of booze that I have a story that will blow you away” ‘he’ says. (The quotes are there for a reason.) “You’re on” says Ethan Hawke the barman. It’s a long tale to be sure, and one that doesn’t quite live up to the bold assertions. But a tale – and a film – that tries to incorporate time travel, gender reassignment, and an infamous terrorist planning his latest destruction, deserves credit just for the sheer and obvious effort put in. None of those things are spoilers by the way. Let’s just say that anyone who doesn’t get that the guy in the bar is actually a girl better not go to Thailand to find true love. Predestination is convoluted to the point that it’s wiser just to accept the claims and go with it. It takes from a great many sci-fi films; Looper, Minority Report, Source Code, and tweaks them sufficiently to avoid accusations of theft. It then cleverly uses the Twilight Zone technique of rewarding a long set-up with a payoff that makes it worth the wait. It is for this reason that Predestination might seem dull and inaccessible, but for anyone who likes even one of those films above, it is most definitely worth the time. Final Rating – 7.5 / 10. There’s something about good sci-fi.